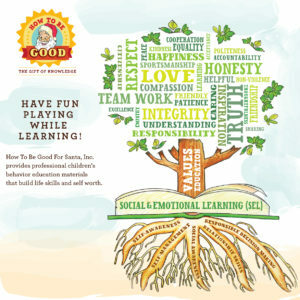 About How To Be Good For Santa, Inc.
Our mission is to inspire, engage, and empower children’s (and guardian’s) behavioral competencies by helping build lifelong relationship skills and self worth through Social & Emotional Learning (SEL) resulting in improved self-awareness, self-management, social awareness, relationship skills, and responsible decision-making. A significant amount of a person’s behavioral foundation is formulated by the age of eight. Most parents (and guardians) are not positive reinforcement experts and/or don’t have the time or expertise to put together the process or materials that resonate with their children. ChildrensBehaviorEducation.com and How To Be Good For Santa, Inc. expertly solves this problem. Our materials help build manners, social skills, good citizenship, listening skills, conflict resolution skills, knowing how to deal with bullying, internet & in-person safety and other life skills! The products break through behavioral learning barriers using wonderful water-colored animal illustrations and fun kid-friendly materials which makes learning proper social behavior fun. Materials are designed to educate children on hundreds of home and school behaviors (and growing). In addition to helping coach individual behaviors, there is strong consistent messaging to be good because it is the right thing to do, not because anyone else is watching. To treat others as you want to be treated, and just because others make mistakes it is not a reason to act improperly in return. Materials are available in Santa and Polite Polly the Parrot branding (for educational purposes and guardians that don’t want to use the Santa theme). Both sets are specifically designed to be used year-round at home or in academic settings. When Lauren Alexa Weiner was only seven years old, she was building a bookstore on a SIM’s game. Jordan T. Weiner, her devoted and supportive father, asked her the name of the book titles she created. As she listed a stream of great titles, one stuck out, her flash of genius–How To Be Good For Santa. And the business concept was born. 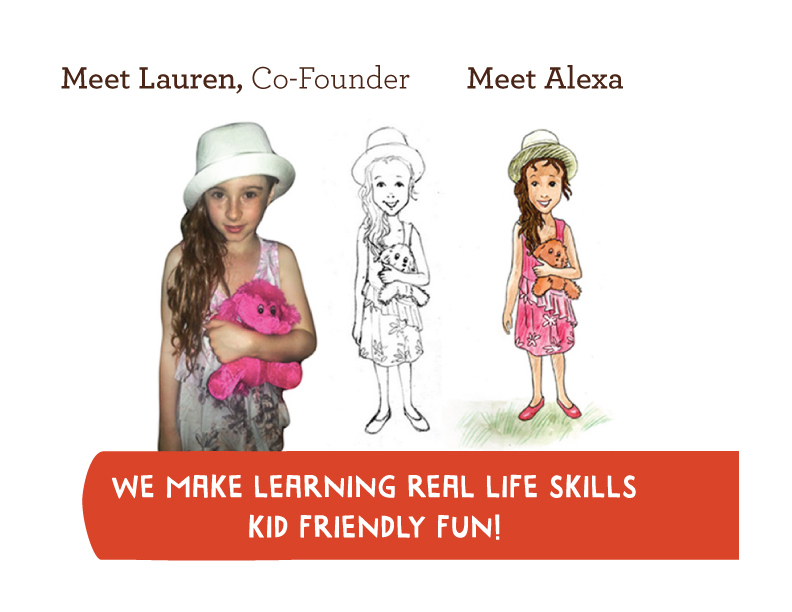 When Lauren turned twelve and became interested in starting a business to earn money and start preparing to get into college we invested significant time, efforts, and resources into the business. Jordan T. Weiner, co-founder (and also the owner of Internet Consulting, Inc.) on-boarded behavioral specialists, top children educators, illustrators, authors, graphic artists, content/copy writers, educational consultants, and other professionals. Products work in synchronization and are portable for on the go or when children are in the care of other guardians. Many parents these days are juggling work, family, recreation, and other things that result in their child(ren) being in the care of other guardians. Our products help parents facilitate universal proper social guidance across all guardians to help ensure positive reinforcement is being used (verses the alternatives). Our materials are for all children (gifted, average or with disabilities). They are Tier 1 and Teir 2 intervention support tools to help students struggling with proper social behavior. Providing consistent messaging and behavioral coaching for addressing needed behavior improvement is now fun and easy. Simply give a sticker, share a flashcard, read a picture book, or let the children play with an activity book to coach the desired behavior education. This is good for the parents, children, and the other guardians. Free Goal Planning Worksheets, Behavior Tracking Charts, Lesson Plans and Templates, Helpful Tips and more These material ensure that children understand and are accountable for behavior goals. How To Be Good Behavior Education Sticker Book Because children love stickers, we created over 900 stickers for home, school and community behaviors. Stickers should be earned, not just given to play with. The stickers sync perfectly with the worksheets and practice materials. They are easy to use and children eagerly learn proper social behavior to earn the Gold Star Reward Stickers.In addition to custom stickers this book provides guardians with helpful tips and tools designed by behavioral therapists and top educators for children. Topics include: listening skills (page 14), conflict resolution (page 18), understanding Social & Emotional Learning (page 30), group behaviors (page 38), how to be an Upstander (page 40), Addressing cyberbullies, haters and problem provokers (page 46), understanding incentives versus bribes (page 54), easy to use lesson plans and lesson plan templates (pages 34 & 35), and much more! 2 sets of Flashcards Each flashcard includes an individual behavior lesson, wonderful character(s), expertly written real life words and actions to use for good behavior, and flashcards to educate children about reacting well even when others are acting badly. Coloring & Doodling Books, Activity/Game Books, and How To Draw Activity Books Kids love to color, doodle, play games, and draw. Children learn while they play. Our goal is to use crowdsourcing to continue to evolve the characters and products ensuring we build interactive materials that address our customer wants/needs. We are not looking for perfection. We have professional illustrators and authors that will take the best of the best ideas and integrate them into our How To Be Good materials. Our ongoing contests have no entry fees. Both children and adults are eligible for entry. Valuable prizes will be awarded to contestants that are first to share great ideas used in our materials. Join our Create A Character Contest now! In addition, everyone can be a winner by having their character being made into a Budsies custom plush animal or doll for a very reasonable fee! We also sponsor and ongoing Create A Character and Author A Behavioral Story Contests. Top new behavioral story-lines are eligible for valuable prizes (if chosen to be used in How To Be Good materials). In addition, for a very reasonable fee, everyone can be a winner by having their story-line made into a custom cartoon by The Peanut Gallery! The Peanut Gallery will also turn any jokes or social media funny stories into custom cartoons. In addition to selling individual products and our “kits” we offer event development programs for needy organizations, retail/wholesale, and re-seller opportunities. If you are ethical to the highest degree and genuinely want to help children and guardians – we will work out the details with you so you can earn revenues while helping others.